Jockey Edgar Morales will lose the five-pound weight allowance that is granted to apprentice riders on Saturday, but the 20-year-old Puerto Rico native has made the most of his final week with the “bug” by winning three races Wednesday to vault to the top of the Churchill Downs jockey standings with 11 victories. Morales grew up in Aibonito, Puerto Rico, which is located almost two hours from the closest racetrack. Once Morales finished school he came to Louisiana and worked as a hot walker and groom prior to becoming an exercise rider. Edgar’s brother, Roberto, also is an accomplished jockey on the Louisiana circuit. Morales got his start as a jockey in 2017 when he finished 12th on his first mount, Basheba, at Keeneland. He recorded his first win one week later on the late Jack Van Berg-trained Star Dog. Morales began Thursday’s card with 98 wins and hopes the successful apprenticeship can lead to an Eclipse Award for Outstanding Apprentice Jockey. “It would be an honor to even be considered,” Morales said. “That was one of the goals and I think this run we’ve been on is going to get us close. Morales won with his first mount on Wednesday’s card, No Funny Biz, in Race 3 for trainer Wes Hawley. He returned to the winner’s circle in Race 8 on the Tom Van Berg-trained Summer Storm and in Race 9 on Richard Castillo’s Zambian Dream. Morales is attempting to become the first apprentice rider to win a meet title at Churchill Downs since Julien Leparoux won the Spring Meet in 2006. HAWAAKOM ‘TRAINING BETTER THAN EVER’ FOR CLARK HANDICAP – Trainer Wes Hawley believes Hawaakom is set for a peak performance in the $500,000 Clark Handicap Presented by Norton Healthcare (Grade I) on Friday, Nov. 23, and hopes his former $15,000 claim can capture an elusive Grade I victory. Hawaakom was last seen at Parx in the Greenwood Cup (GIII) where he finished a disappointing seventh. The 8-year-old chestnut by Jazil was fourth in the Stephen Foster Handicap (GI) in the Spring Meet at Churchill Downs. Hawaakom began his career under the care of Danny Peitz and was claimed by Hawley on Nov. 27, 2014 at Churchill Downs. Since he was claimed, Hawaakom has earned $996,213 in Hawley’s care, including a 3 ¼-length score in the $500,000 Razorback Handicap (GIII) at Oaklawn Park. Hawley noted jockey Joe Rocco Jr. will have the call on Hawaakom in the Clark Handicap. Weight assignments for the 1 1/8-mile Clark will be finalized on Saturday. The field is expected to include: Believe in Royalty (trainer Larry Jones); Bravazo (D. Wayne Lukas); Hawaakom (Hawley); Hence (Steve Asmussen); Leofric (Brad Cox); Prime Attraction (James Cassidy); and Seeking the Soul (Dallas Stewart), according to Churchill Downs Assistant Racing Secretary and Stakes Coordinator Dan Bork. MR. MISUNDERSTOOD 8-5 MORNING LINE FAVORITE FOR SATURDAY’S RIVER CITY ‘CAP – Flurry Racing Stables’ 11-time winner Mr. Misunderstood was made the 8-5 morning line favorite for Saturday’s 41st running of the $100,000 River City Handicap (Grade III) at Churchill Downs. 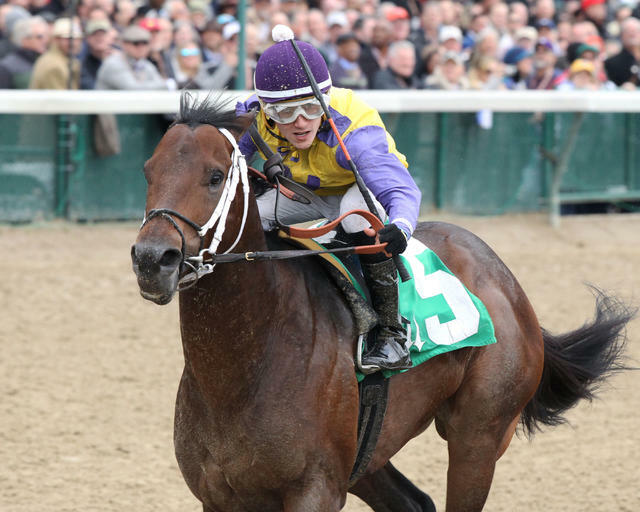 Trained by Louisville-native Brad Cox, Mr. Misunderstood has won seven stakes races through his 20-race career including a half-length triumph in the $200,000 Wise Dan (GII) in the Spring Meet at Churchill Downs. The 4-year-old gelding by Archarcharch is perfect through three starts over the Churchill Downs turf course. Most recently, the Kentucky bred finished sixth in the Shadwell Turf Mile (GI) at Keeneland. Cox also entered Mr. Misunderstood’s stablemate, Big Changes, in the River City Handicap as the 6-year-old gelding will attempt to score his sixth win in a row. Jockey Florent Geroux has the call Mr. Misunderstood while Julien Leparoux will get a leg up on Big Changes. The complete River City field (with jockey, trainer, assigned weight and morning line odds): Master Merion (Albin Jiminez, Wesley Ward, 117 pounds, 10-1); Postulation (Brian Hernandez Jr., Michael Matz, 115, 5-1); Mr. Misunderstood (Geroux, Cox, 121, 8-5); Oscar Nominated (Tyler Gaffalione, Mike Maker, 120, 4-1); Big Changes (Leparoux, Cox, 119, 5-1); Team Colors (Adam Beschizza, Joe Sharp, 115, 12-1); Flatlined (Joe Rocco Jr., Kelly Von Hemel, 116, 15-1); and Sir Dudley Digges (Corey Lanerie, Mike Maker, 117, 8-1). DOWN THE STRETCH – Racing at Churchill Downs continued Thursday with a first post of 1 p.m. (all times Eastern). There is a massive $104,747 carryover in the 20-cent Single 6 Jackpot which gets underway in Race 5 at 3:03 p.m. … Trainer Dallas Stewart reported Wednesday that John Velazquez has the call on Seeking the Soul in the Clark Handicap. … Trainer Brad Cox is two wins away from 1,000-career victories. The Louisville native has a pair of horses entered Thursday at both Churchill Downs and Aqueduct. … Churchill Downs’ all-time leading trainer Dale Romans is five wins away from 2,000-career victories and has one horse entered Thursday. … Trainer Kenny McPeek’s assistant Greg Geier reported he expects Breeders’ Cup Juvenile (GI) third Signalman and Breeders’ Cup Juvenile Fillies (GI) runner-up Restless Rider to enter the Nov. 24, $200,000 Kentucky Jockey Club (GII) and $200,000 Golden Rod (GII), respectively.